Last October I ran out of time to post about several fall designs that had been published in Crochet World - so I thought I would share about them this year while there's still time to make a few small things for your Thanksgiving table. 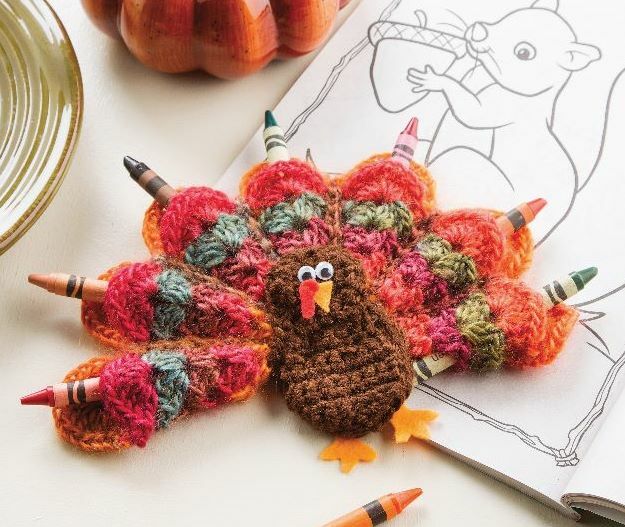 The Crayon Gobbler - A fun turkey decoration that is not only pretty but also practical - each feather pocket can hold a crayon. I enjoyed 'engineering' this design and seeing it come together. 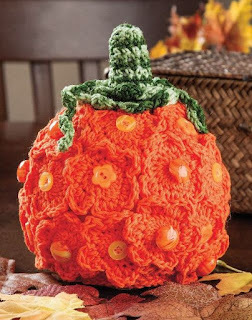 The editors at Crochet World told me that it was a hit on Facebook last fall. The Petaled Pumpkin - I crocheted all of the flowers with Omega's Sinfonia cotton yarn and found a variety of buttons and beads at my local craft store to embellish the centers. Inside is hiding a styrofoam ball that helps the pumpkin keep its shape and stay light. 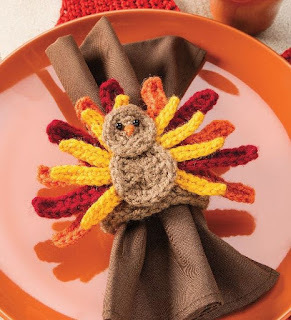 Turkey Napkin Ring - You can never have too many turkeys at Thanksgiving, right? This little guy is made to slide over your folded napkins. He would be even cuter if you gave him a felt T-shirt in the colors of your favorite football team!